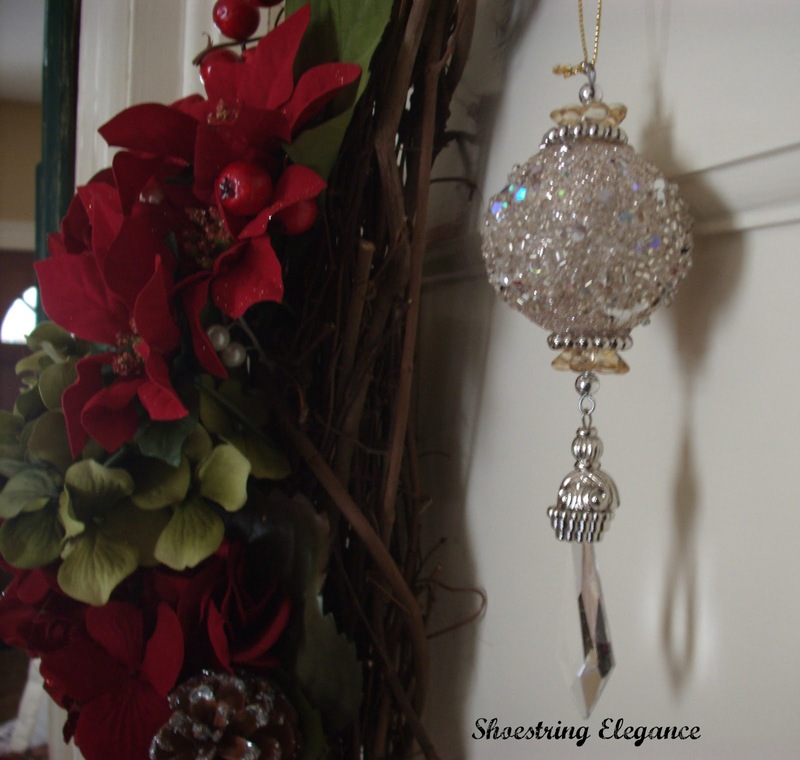 Shoestring Elegance: Decking the Halls! Sorry it took me so long to get this posted to share with you today!! I love this wreath and it’s funny, when writing a blog, you want to share with everyone something special that you made, but some of your most beautiful creations don’t always translate as beautiful in picture as they are in person. So please bear with me, as I have tried to include different angles of this wreath, that I am so enjoying, as to share with you how Beautiful it actually turned out. This is My Shoestring Elegant Christmas Wreath!!! If you are out looking to make a wreath of your own, Michael’s has had some pretty incredible savings lately, with 50% off their stems, ribbons and Christmas decorations. And if you are lucky enough to get a tip like I did, there are a great many coupons on-line and in the paper, (for Michael’s and JoAnne’s (Michael’s will take their coupons too) for an additional 40-50% off. This time I luckily Including a real treat of a coupon for another 30% your entire bill…So here’s the breakdown: the stems, ribbons, wreath and pine-cones all together cost me a grand total of $16 and some cents! I am absolutely over the moon for this wreath! I hope you enjoy it, too. A little time, spent working to Christmas music and making bows and Voila! I’m decking the Halls with a fun Wreath to start!! As always, Many Blessings to you all !! That wreath is so elegant looking! I love all the little details. As far as Michael's goes, where I live (Canada), you can't combine coupons if something is already on sale. Actually, that is pretty much the policy with all the stores in Canada. If I lived in the U.S., man, I could make a killing with coupons, whoo! hoo! Sue, Thanks so much for your wonderfully kind words! ...and I'm sorry about the Canadian coupon policy, I am very aware of it! Mt family is from and many still live in Moncton, NB, and they get as annoyed as you, and love it when they visit to see and get all the deals. But then again, we don't have the caliber of quality garage sales that you have!! LOL..
That looks awesome! I cant wait to see it in person. 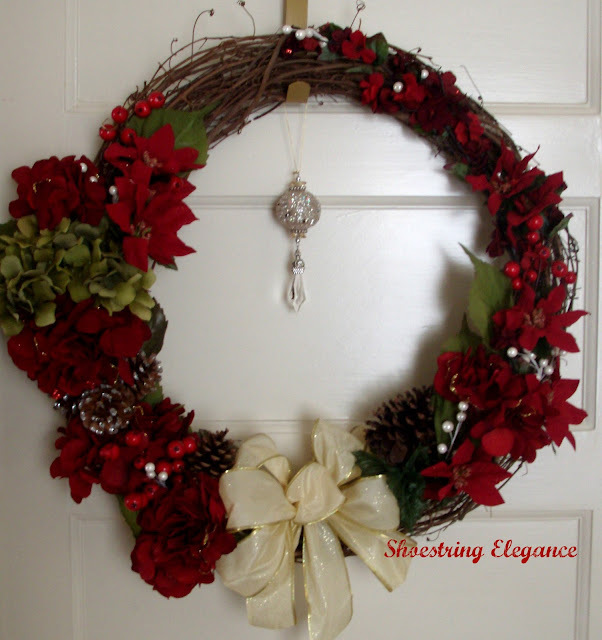 Gorgeous wreath my friend, Thanks for linking up. Thanks so much for having me, Kristin!!! I just made my first few wreathes this year. Yours turned out much better then mine lol. Nice post. Thanks so much, Garret!! Everybody seems to have definitive taste of what type of wreath they like. I'm sure yours were beautiful!! Thanks for the lovely comment! Thanks so much heading over to link up!! Thank so much, Dixie and Dottie!! Heading over to your Christmas party now!! What Glorious fun!! Hey Lisa, Thanks so much for your kind words!! Popping over to your Farm Girl Blog to link up!! Thanks for the invitation!! Thanks, Katie!!! I'm glad you liked it!!! Your wreath is so beautiful. 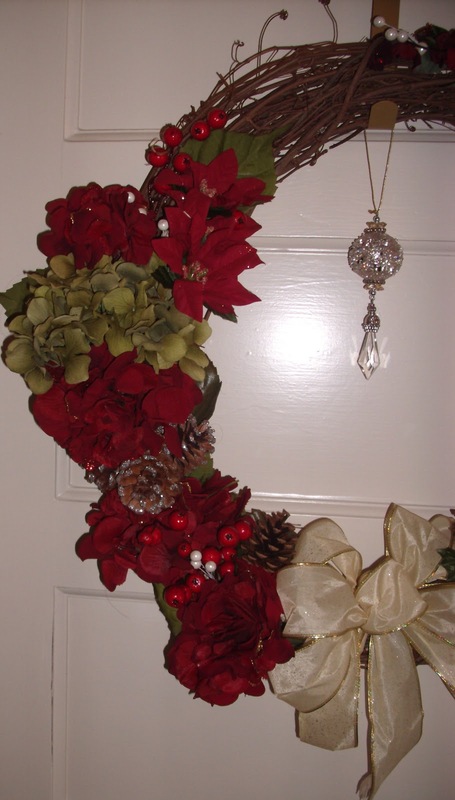 The red poinsettias and the cream bow make a striking contrast. Love your blog and will be joining. Hope you will visit us and do the same! Linda, Thanks so much for the lovely comment. I'm so pleased you like my blog. :) I did come visit your blog, as well, very wonderful to see!! See you soon!! Your Christmas wreath really is lovely! Would love to see it in person. Thank you for sharing this with my HOME and enjoy your weekend. It's been a long time. SO happy to you got to come check this one out. I so wish you were closer, too and we'd do a Christmas Tea Brunch!! I pray your well dear friend. Thanks, Sarah!!! I couldn't resist the little bit of old bling!! Gorgeous! Thanks for linking up to the Keep Calm and Link Up! Hope to see you back next week! Thanks so much, I'll be back for sure. Thanks so much for your lovely party and comment! Your wreath is simply gorgeous...love the bling accent! Thanks so much, JP!!! Yep, I couldn't resist!! Favorite projects are definitely for the Holidays!!! Stopped by to say hello...I love your wreath and pinned it. I am your newest follower! Thanks for the follow and the Pin!! So pleased you liked it so much!! WOW! Gorgeous! Very pretty...thank you for linking up to the No Rules Christmas Party! Happy Holidays! Thanks so much, Jen!! You are too kind. Happy Holidays to you as well!! This wreath is gorgeous. I love the punch of color the poinsettia adds! Thanks for sharing on the homemade holiday party. Thanks so much, Marilyn!! I'm so glad you like it!! Thanks for the lovely party, my dear. 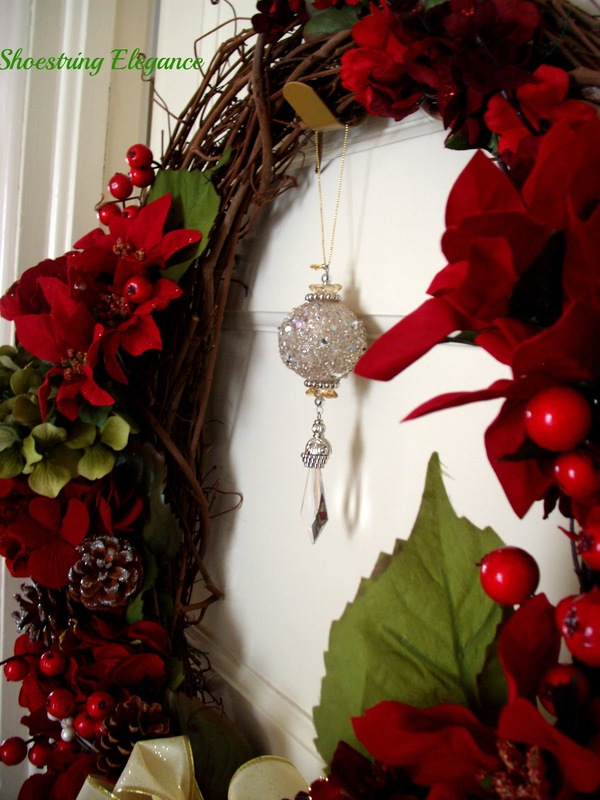 I think it looks so beautiful and turned out to be a wonderful holiday addition to you home. watching it all come together was very nice, Good Job Theresa. Thank you so much, Pam!!! It does fit doesn't it? I'm grateful you were here,too!! You are very sweet to say such nice things. I would be thinking you might be getting sick of seeing all my different "Projects" LOL.. Thanks for sharing at Shabbilicious Friday. Thanks, I will be hopping over as soon as I can! What a beautiful wreath! There's a Michael's just a few blocks away from where I live and I love browsing the floral aisles for fun stuff. :-) Thanks for linking this up to the Winter Wonders & Holiday Happenings link party! Very pretty, love the mixed florals and the bling! Thanks for sharing. Visiting from Between Naps on the Porch. Thanks so much Shanee for your kind comment. I'm so glad you liked it, get yourself in on some of those floral @ Michael's..the sales are all now!